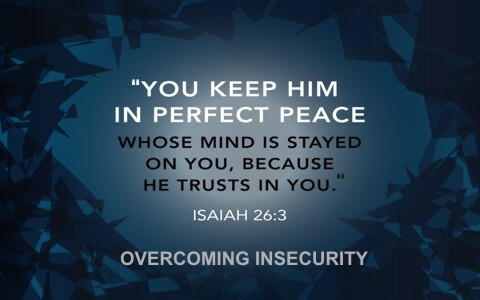 Here are seven great Bible verses that can help you to overcome insecurity. No one can have the peace of God until they’ve made peace with God, however there’s an irreconcilable difference between us and God, and it is our sins. They’ve cut us off from a Holy God (Isaiah 59:2; Rom 3:23). We need help to even have access to the Father. Thankfully, our hope is found in Jesus Christ (Acts 4:12). If we’ve been justified by faith, then we are now at peace with God and we can have the peace of God (John 14:27). There is no other way than through Jesus Christ by which we’re able to stand before God. That’s why the Apostle Paul wrote, “we rejoice in the hope” because we can now stand before God. This is only possible because the Father doesn’t see our sinfulness anymore; He sees Jesus’ righteousness (2nd Cor 5:21). That’s crucial because we have no righteousness of our own (Rom 3:10-12, 23). The Greek word used for “casts” doesn’t simply mean, “toss it aside.” The word suggests we take our fear and “throw it away” or “let go of it,” so it requires action on our part. Just as we choose to praise God in the storm (against our human nature) and we chose to be joyful during hardships, we must choose to let go of our fear and let God take care of it. I know it’s a cliché but here, it may be more fitting than ever; “Let go and let God,” but you’ve still got to “let it go.” When you find that you’ve really cast it away, there’s no more fear of punishment. The perfect love of God was no better displayed than on the cross. Our punishment of a coming judgement has already been placed on Him by the agape love of God. That means the fear of punishment is unfounded. You’re not guilty anymore because of Christ. You’ve received the free gift of eternal life (Eph 2:8-9). That love shown for you (and me) should drive our fears completely away…and do so, forever. These words from Jesus are not suggestions but imperative commands, just as much as the Great Commission is (Matt 28:19-20). Jesus is specific in saying, “I tell you” (and certainly, us), “do not be anxious about your life.” The structure of the sentence is very much like that of the Ten Commandments. Since Jesus is God and He is commanding us to do something, we know that it’s ultimately for our very best. That’s because Jesus is God and God always does that which is good, despite what it might feel like or look like at the time. He wants eye-to-eye contact with us and we can only do that if we stop looking at our (eat, drink, clothing) own needs. Besides, Jesus promised to those who seek the kingdom first, it’s all going to be taken care of (Matt 6:33). The Greek word for “temptation” is “peirasmos” which means “an experiment, trial,” or “a proving,” so Paul does not only mean “temptation” but no trial, proving, testing, or actually temptation “has overtaken [them, us] that is not common to man. The Apostle Paul wants to comfort the Corinthians (and us) by telling them that they’re not alone. All of us go through a lot of temptations, trials, and tests. Just ask Job! God is always faithful to His Word and He is not going to let you or me to be tested beyond our ability to escape, however, this “escape” doesn’t come by us. This verse says, “He will also provide the way of escape.” We still must choose to seek and to find the exit; but even here, it is God Who shows us the way to escape, but we must still do the escaping! If you were before a judge in a court of law (and I have been), then you can appreciate this one more. It’s like we’re all standing before the God of the Heavens, the Holy God Himself, and He is our Judge. He knows we’re all guilty (Rom 7:7), and that none deserve pardon, but then…the Advocate steps in…on our behalf. The moment you trust in the Advocate, there is “no more condemnation,” because “all who “are in Christ Jesus” are set free “from the law of sin and death.” This is not a time to represent yourself before God because God requires perfection. You can read just how disastrous it will be without having Christ as their Advocate at the Great White Throne Judgment (Rev 20:12-15). In fact, He’s the one on the throne. For those who reject Jesus Christ, there’s no Intercessor or Mediator for them, so thank God today because you’re condemnation’s been lifted. Hallelujah! Praise God. Thank you Jesus! Now, pray for those who need Christ. You have two different uses of the word “peace” in this world. One is to have peace between nations or peace between neighbors or family members. When you’re at peace with people, it’s a great feeling and your relationships are good…but when you don’t have that peace and an argument and separation occurs, you can lose your peace with your friends or family. If your peace depends on circumstances, then that’s not a stable peace at all. It can come and it can go, however, the peace Jesus leaves is a permanent possession and it’s a peace that nobody’s going to take from you. No man, woman, or demon can take the peace Jesus leaves us, “Therefore, since we have been justified by faith, we have peace with God through our Lord Jesus Christ” (Rom 5:1). I strongly suggest you read Romans chapter 8 to help you overcome your insecurity. We all have them. You’re not alone in that, so why not replace your insecurity with the security found in the Word of God, the Bible. There is a calming assurance gained from reading the Word of God every day because it’s God speaking to you. God’s Word has the power to change us and when it comes with the Spirit of God, there can be a sense of peace and calm as to be unlike any peace that the world knows. The Apostle Paul wrote, “Who shall bring any charge against God’s elect? It is God who justifies” (Rom 8:33). That verse alone should overcome your insecurity. Related reading for you: What Does the Bible Say About Insecurity? Thank you Pastor Jack for sharing your articles. God bless you. Thank you Richard. All glory to God. I have nothing that was not given to me (1 Cor 4:4). Previous post: Who Was Moses’ Wife? Was Moses Married?